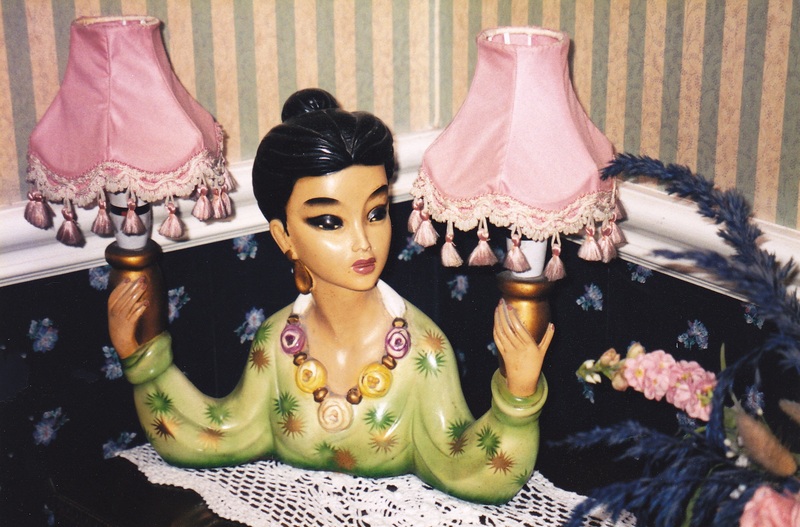 When I saw this particular lampshade at the B&B in Ireland, I was “gob-smacked”. I had never seen anything like this before. “Kitsch” is a word that immediately comes to mind, but it is “so bad – it is cool” or it is just “bad”. There were lots of interesting paraphernalia in this eclectic household come B&B. My most unnerving moment was in the breakfast room where I had the distinct feeling that I was being “watched” or observed by someone or something. I turned around and saw a pair of wildebeest heads watching me consume my meagre muesli breakfast. However, I could not help thinking how it reminded me of the resplendent decor of the Addam’s family house (original TV series – if you please) and the moose head that used to hang on the wall. I’m not sure whether I remember correctly or not, but didn’t the antlers on the moose move during various episodes? Likewise, lots of props, ornaments and “Things” had names. Was the moose’s name Reuben?. (I remember the white bear rug was called Bruno). And whilst I am still on the Addam’s Family theme (click-click), I recall that Cousin Farouk, was named as the owner of the leg that jutted out from the stuffed swordfish on the wall and how another cousin;Nanook, sent a totem pole to them for Xmas and wanted their stuffed bear in return. For further information on Totem poles see this post. This entry was posted in Ceramics, QuestionableArt, TheBad and tagged Addam's Family, bad-taste lampshade, lampshade. Bookmark the permalink.